"Slavic language" redirects here. For other uses, see Slavic language (disambiguation). The Slavic languages (also called Slavonic languages) are the Indo-European languages spoken by the Slavic peoples. They are thought to descend from a proto-language called Proto-Slavic, spoken during the Early Middle Ages, which in turn is thought to have descended from the earlier Proto-Balto-Slavic language, linking the Slavic languages to the Baltic languages in a Balto-Slavic group within the Indo-European family. Political map of Europe with countries where a Slavic language is a national language marked in shades of green. Wood green represents East Slavic languages, pale green represents West Slavic languages, and sea green represents South Slavic languages. The Slavic languages are divided intro three subgroups: East, West, and South, which together constitute more than 20 languages. Of these, 10 have at least one million speakers and official status as the national languages of the countries in which they are predominantly spoken: Russian, Belarusian and Ukrainian (of the East group), Polish, Czech and Slovak (of the West group) and Slovene, Serbo-Croatian, Macedonian and Bulgarian (of the South group). The current geographic distribution of natively spoken Slavic languages covers Eastern Europe, the Balkans, Central Europe and all of the territory of Russia, which includes northern and north-central Asia. Furthermore, the diasporas of many Slavic peoples have established isolated minorities of speakers of their languages all over the world. The number of speakers of all Slavic languages together is estimated to be 315 million. [unreliable source?] Despite the large extent, the individual Slavic languages are considerably less differentiated than Germanic and Romance languages. Some linguists speculate that a North Slavic branch has existed as well. The Old Novgorod dialect may have reflected some idiosyncrasies of this group. Mutual intelligibility also plays a role in determining the West, East, and South branches. Speakers of languages within the same branch will in most cases be able to understand each other at least partially, but they are generally unable to across branches (which would be comparable to a native English speaker trying to understand any other Germanic language). The most obvious differences between the East, West and South Slavic branches are in the orthography of the standard languages: West Slavic languages (and Western South Slavic languages - Croatian and Slovene) are written in the Latin script, and have had more Western European influence due to their proximity and speakers being historically Roman Catholic, whereas the East Slavic and Eastern South Slavic languages are written in Cyrillic and, with Eastern Orthodox or Uniate faith, have had more Greek influence. East Slavic languages such as Russian have, however, during and after Peter the Great's Europeanization campaign, absorbed many words of Latin, French, German, and Italian origin. The tripartite division of the Slavic languages does not take into account the spoken dialects of each language. Of these, certain so-called transitional dialects and hybrid dialects often bridge the gaps between different languages, showing similarities that do not stand out when comparing Slavic literary (i.e. standard) languages. For example, Slovak (West Slavic) and Ukrainian (East Slavic) are bridged by the Rusyn language/dialect of Eastern Slovakia and Western Ukraine. Similarly, the Croatian Kajkavian dialect is more similar to Slovene than to the standard Croatian language. Although the Slavic languages diverged from a common proto-language later than any other group of the Indo-European language family, enough differences exist between the various Slavic dialects and languages to make communication between speakers of different Slavic languages difficult. Within the individual Slavic languages, dialects may vary to a lesser degree, as those of Russian, or to a much greater degree, as those of Slovene. 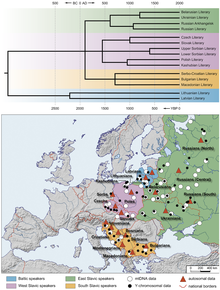 Slavic languages descend from Proto-Slavic, their immediate parent language, ultimately deriving from Proto-Indo-European, the ancestor language of all Indo-European languages, via a Proto-Balto-Slavic stage. During the Proto-Balto-Slavic period a number of exclusive isoglosses in phonology, morphology, lexis, and syntax developed, which makes Slavic and Baltic the closest related of all the Indo-European branches. 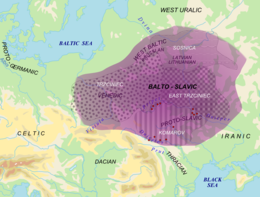 The secession of the Balto-Slavic dialect ancestral to Proto-Slavic is estimated on archaeological and glottochronological criteria to have occurred sometime in the period 1500–1000 BCE. 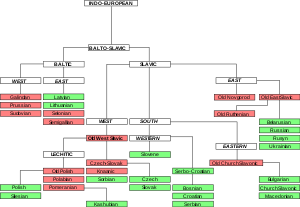 A minority of Baltists maintain the view that the Slavic group of languages differs so radically from the neighboring Baltic group (Lithuanian, Latvian, and the now-extinct Old Prussian), that they could not have shared a parent language after the breakup of the Proto-Indo-European continuum about five millennia ago. Substantial advances in Balto-Slavic accentology that occurred in the last three decades, however, make this view very hard to maintain nowadays, especially when one considers that there was most likely no "Proto-Baltic" language and that West Baltic and East Baltic differ from each other as much as each of them does from Proto-Slavic. Baška tablet, 11th century, Krk, Croatia. Lockwood also notes that these languages have "enriched" themselves by drawing on Church Slavonic for the vocabulary of abstract concepts. The situation in the Catholic countries, where Latin was more important, was different. The Polish Renaissance poet Jan Kochanowski and the Croatian Baroque writers of the 16th century all wrote in their respective vernaculars (though Polish itself had drawn amply on Latin in the same way Russian would eventually draw on Church Slavonic). 14th-century Novgorodian children were literate enough to send each other letters written on birch bark. Although Church Slavonic hampered vernacular literatures, it fostered Slavonic literary activity and abetted linguistic independence from external influences. Only the Croatian vernacular literary tradition nearly matches Church Slavonic in age. It began with the Vinodol Codex and continued through the Renaissance until the codifications of Croatian in 1830, though much of the literature between 1300 and 1500 was written in much the same mixture of the vernacular and Church Slavonic as prevailed in Russia and elsewhere. The most important early monument of Croatian literacy is the Baška tablet from the late 11th century. It is a large stone tablet found in the small Church of St. Lucy, Jurandvor on the Croatian island of Krk, containing text written mostly in Čakavian dialect in angular Croatian Glagolitic script. The independence of Dubrovnik facilitated the continuity of the tradition. 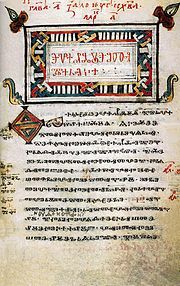 10th–11th century Codex Zographensis, canonical monument of Old Church Slavonic. More recent foreign influences follow the same general pattern in Slavic languages as elsewhere and are governed by the political relationships of the Slavs. In the 17th century, bourgeois Russian (delovoi jazyk) absorbed German words through direct contacts between Russians and communities of German settlers in Russia. In the era of Peter the Great, close contacts with France invited countless loan words and calques from French, a significant fraction of which not only survived but also replaced older Slavonic loans. In the 19th century, Russian influenced most literary Slavic languages by one means or another. The Proto-Slavic language existed until around AD 500. By the 7th century, it had broken apart into large dialectal zones. There are no reliable hypotheses about the nature of the subsequent breakups of West and South Slavic. East Slavic is generally thought to converge to one Old Russian or Old East Slavonic language, which existed until at least the 12th century. Linguistic differentiation was accelerated by the dispersion of the Slavic peoples over a large territory, which in Central Europe exceeded the current extent of Slavic-speaking majorities. Written documents of the 9th, 10th, and 11th centuries already display some local linguistic features. For example, the Freising manuscripts show a language that contains some phonetic and lexical elements peculiar to Slovene dialects (e.g. rhotacism, the word krilatec). The Freising manuscripts are the first Latin-script continuous text in a Slavic language. The migration of Slavic speakers into the Balkans in the declining centuries of the Byzantine Empire expanded the area of Slavic speech, but the pre-existing writing (notably Greek) survived in this area. The arrival of the Hungarians in Pannonia in the 9th century interposed non-Slavic speakers between South and West Slavs. Frankish conquests completed the geographical separation between these two groups, also severing the connection between Slavs in Moravia and Lower Austria (Moravians) and those in present-day Styria, Carinthia, East Tyrol in Austria, and in the provinces of modern Slovenia, where the ancestors of the Slovenes settled during first colonisation. In September 2015, Alexei Kassian and Anna Dybo published, as a part of interdisciplinary study of Slavic ethnogenesis, a lexicostatistical classification of Slavic languages. It was built using qualitative 110-word Swadesh lists that were compiled according to the standards of the Global Lexicostatistical Database project and processed using modern phylogenetic algorithms. The resulting dated tree complies with the traditional expert views on the Slavic group structure. Kassian-Dybo’s tree suggests that Proto-Slavic first diverged into three branches: Eastern, Western and Southern. The Proto-Slavic break-up is dated to around 100 A.D., which correlates with the archaeological assessment of Slavic population in the early 1st millennium A.D. being spread on a large territory and already not being monolithic. Then, in the 5th and 6th centuries A.D., these three Slavic branches almost simultaneously divided into sub-branches, which corresponds to the fast spread of the Slavs through Eastern Europe and the Balkans during the second half of the 1st millennium A.D. (the so-called Slavicization of Europe). The Slovenian language was excluded from the analysis, as both Ljubljana koine and Literary Slovenian show mixed lexical features of Southern and Western Slavic languages (which could possibly indicate the Western Slavic origin of Slovenian, which for a long time was being influenced on the part of the neighboring Serbo-Croatian dialects),[original research?] and the quality Swadesh lists were not yet collected for Slovenian dialects. Because of scarcity or unreliability of data, the study also did not cover the so-called Old Novgordian dialect, the Polabian language and some other Slavic lects. The following is a summary of the main changes from Proto-Indo-European (PIE) leading up to the Common Slavic (CS) period immediately following the Proto-Slavic language (PS). In a cluster of obstruent (stop or fricative) + another consonant, the obstruent is deleted unless the cluster can occur word-initially. (occurs later, see below) Monophthongization of diphthongs. (occurs much later, see below) Elimination of liquid diphthongs (e.g. *er, *ol when not followed immediately by a vowel). First palatalization: *k, *g, *x → CS *č, *ž, *š (pronounced [tʃ], [ʒ], [ʃ] respectively) before a front vocalic sound (*e, *ē, *i, *ī, *j). Vowel fronting: After *j or some other palatal sound, back vowels are fronted (*a, *ā, *u, *ū, *ai, *au → *e, *ē, *i, *ī, *ei, *eu). This leads to hard/soft alternations in noun and adjective declensions. Prothesis: Before a word-initial vowel, *j or *w is usually inserted. Second palatalization: *k, *g, *x → CS *c [ts], *dz, *ś before new *ē (from earlier *ai). *ś later splits into *š (West Slavic), *s (East/South Slavic). Progressive palatalization (or "third palatalization"): *k, *g, *x → CS *c, *dz, *ś after *i, *ī in certain circumstances. *or, *ol, *er, *el → *ro, *lo, *re, *le in West Slavic. *or, *ol, *er, *el → *oro, *olo, *ere, *olo in East Slavic. *or, *ol, *er, *el → *rā, *lā, *re, *le in South Slavic. Possibly, *ur, *ul, *ir, *il → syllabic *r, *l, *ř, *ľ (then develops in divergent ways). Development of phonemic tone and vowel length (independent of vowel quality): Complex developments (see History of accentual developments in Slavic languages). The Slavic languages are a relatively homogeneous family, compared with other families of Indo-European languages (e.g. Germanic, Romance, and Indo-Iranian). As late as the 10th century AD, the entire Slavic-speaking area still functioned as a single, dialectally differentiated language, termed Common Slavic. Compared with most other Indo-European languages, the Slavic languages are quite conservative, particularly in terms of morphology (the means of inflecting nouns and verbs to indicate grammatical differences). Most Slavic languages have a rich, fusional morphology that conserves much of the inflectional morphology of Proto-Indo-European. 1The sound /sʲ/ did not occur in West Slavic, where it had developed to /ʃ/. This inventory of sounds is quite similar to what is found in most modern Slavic languages. The extensive series of palatal consonants, along with the affricates *ts and *dz, developed through a series of palatalizations that happened during the Proto-Slavic period, from earlier sequences either of velar consonants followed by front vowels (e.g. *ke, *ki, *ge, *gi, *xe, and *xi), or of various consonants followed by *j (e.g. *tj, *dj, *sj, *zj, *rj, *lj, *kj, and *gj, where *j is the palatal approximant ([j], the sound of the English letter "y" in "yes" or "you"). This general process of palatalization did not occur in Serbo-Croatian and Slovenian. As a result, the modern consonant inventory of these languages is nearly identical to the Late Common Slavic inventory. Late Common Slavic tolerated relatively few consonant clusters. However, as a result of the loss of certain formerly present vowels (the weak yers), the modern Slavic languages allow quite complex clusters, as in the Russian word взблеск [vzblʲesk] ("flash"). Also present in many Slavic languages are clusters rarely found cross-linguistically, as in Russian ртуть [rtutʲ] ("mercury") or Polish mchu [mxu] ("moss", gen. sg.). The word for "mercury" with the initial rt- cluster, for example, is also found in the other East and West Slavic languages, although Slovak retains an epenthetic vowel (ortuť). The sound [ɨ] occurs only in some languages (Russian and Belarusian), and even in these languages, it is unclear whether it is its own phoneme or an allophone of /i/. Nonetheless, it is a quite prominent and noticeable characteristic of the languages in which it is present. Common Slavic also had two nasal vowels: *ę [ẽ] and *ǫ [õ]. However, these are preserved only in modern Polish (along with a few lesser-known dialects and microlanguages; see Yus for more details). Other phonemic vowels are found in certain languages (e.g. the schwa /ə/ in Bulgarian and Slovenian, distinct high-mid and low-mid vowels in Slovenian, and the lax front vowel /ɪ/ in Ukrainian). All vowels could occur either short or long, and this was phonemic (it could not automatically be predicted from other properties of the word). There was (at most) a single accented syllable per word, distinguished by higher pitch (as in modern Japanese) rather than greater dynamic stress (as in English). Vowels in accented syllables could be pronounced with either a rising or falling tone (i.e. there was pitch accent), and this was phonemic. The accent was free in that it could occur on any syllable and was phonemic. The accent was mobile in that its position could potentially vary among closely related words within a single paradigm (e.g. the accent might land on a different syllable between the nominative and genitive singular of a given word). Even within a given inflectional class (e.g. masculine i-stem nouns), there were multiple accent patterns in which a given word could be inflected. For example, most nouns in a particular inflectional class could follow one of three possible patterns: Either there was consistent accent on the root (pattern A), predominant accent on the ending (pattern B), or accent that moved between root and ending (pattern C). In patterns B and C, the accent in different parts of the paradigm shifted not only in location but also type (rising vs. falling). Each inflectional class had its own version of patterns B and C, which might differ significantly from one inflectional class to another. Slovenian preserves most of the system but has shortened all unaccented syllables and lengthened non-final accented syllables so that vowel length and accent position largely co-occur. Russian and Bulgarian have eliminated distinctive vowel length and tone and converted the accent into a stress accent (as in English) but preserved its position. As a result, the complexity of the mobile accent and the multiple accent patterns still exists (particularly in Russian because it has preserved the Common Slavic noun inflections, while Bulgarian has lost them). Old Polish had a system very much like Czech. Modern Polish has lost vowel length, but some former short-long pairs have become distinguished by quality (e.g. [o oː] > [o u]), with the result that some words have vowel-quality changes that exactly mirror the mobile-length patterns in Czech and Slovak. Similarly, Slavic languages have extensive morphophonemic alternations in their derivational and inflectional morphology, including between velar and postalveolar consonants, front and back vowels, and between a vowel and no vowel. The following is a very brief selection of cognates in basic vocabulary across the Slavic language family, which may serve to give an idea of the sound changes involved. This is not a list of translations: cognates have a common origin, but their meaning may be shifted and loanwords may have replaced them. Most languages of the former Soviet Union and of some neighbouring countries (for example, Mongolian) are significantly influenced by Russian, especially in vocabulary. The Romanian, Albanian, and Hungarian languages show the influence of the neighboring Slavic nations, especially in vocabulary pertaining to urban life, agriculture, and crafts and trade—the major cultural innovations at times of limited long-range cultural contact. In each one of these languages, Slavic lexical borrowings represent at least 15% of the total vocabulary. However, Romanian has much lower influence from Slavic than Albanian or Hungarian. This is potentially because Slavic tribes crossed and partially settled the territories inhabited by ancient Illyrians and Vlachs on their way to the Balkans. Although also spoken in neighbouring lands, the Germanic languages show less significant Slavic influence, partly because Slavic migrations were mostly headed south rather than west. Slavic tribes did push westwards into Germanic territory, but borrowing for the most part seems to have been from Germanic to Slavic rather than the other way: for instance, the now-extinct Polabian language was heavily influenced by German, far more than any living Slavic language today. The Slavic contributions to Germanic languages remains a moot question, though Max Vasmer, a specialist in Slavic etymology, has claimed that there were no Slavic loans into Proto-Germanic. The only Germanic languages that shows significant Slavic influence are Yiddish and the historical colonial dialects of German that were spoken East of the Oder–Neisse line, such as Silesian German (formerly spoken in Silesia and South of East Prussia) and the Eastern varieties of East Low German, with the exception of Low Prussian, which had a strong Baltic substratum. Modern Dutch slang, especially the Amsterdam dialect, borrowed much from Yiddish in turn. However, there are isolated Slavic loans (mostly recent) into other Germanic languages. For example, the word for "border" (in modern German Grenze, Dutch grens) was borrowed from the Common Slavic granica. There are, however, many cities and villages of Slavic origin in Eastern Germany, the largest of which are Berlin, Leipzig and Dresden. English derives quark (a kind of cheese, not the subatomic particle) from the German Quark, which in turn is derived from the Slavic tvarog, which means "curd". Many German surnames, particularly in Eastern Germany and Austria, are Slavic in origin. Swedish also has torg (market place) from Old Russian tъrgъ or Polish targ, tolk (interpreter) from Old Slavic tlŭkŭ, and pråm (barge) from West Slavonic pramŭ. The Czech word robot is now found in most languages worldwide, and the word pistol, probably also from Czech, is found in many European languages, such as Greek πιστόλι. A well-known Slavic word in almost all European languages is vodka, a borrowing from Russian водка (vodka) – which itself was borrowed from Polish wódka (lit. "little water"), from common Slavic voda ("water", cognate to the English word) with the diminutive ending "-ka". Owing to the medieval fur trade with Northern Russia, Pan-European loans from Russian include such familiar words as sable. The English word "vampire" was borrowed (perhaps via French vampire) from German Vampir, in turn derived from Serbian vampir, continuing Proto-Slavic *ǫpyrь, although Polish scholar K. Stachowski has argued that the origin of the word is early Slavic *vąpěrь, going back to Turkic oobyr. Several European languages, including English, have borrowed the word polje (meaning "large, flat plain") directly from the former Yugoslav languages (i.e. Slovene, Croatian, and Serbian). During the heyday of the USSR in the 20th century, many more Russian words became known worldwide: da, Soviet, sputnik, perestroika, glasnost, kolkhoz, etc. Also in the English language borrowed from Russian is samovar (lit. "self-boiling") to refer to the specific Russian tea urn. The following tree for the Slavic languages derives from the Ethnologue report for Slavic languages. It includes the ISO 639-1 and ISO 639-3 codes where available. Church Slavonic language, derived from Old Church Slavonic, but with significant replacement of the original vocabulary by forms from the Old East Slavic and other regional forms. The Bulgarian Orthodox Church, Russian Orthodox Church, Polish Orthodox Church, Macedonian Orthodox Church, Serbian Orthodox Church, and even some Roman Catholic Churches in Croatia continue to use Church Slavonic as a liturgical language. While not used in modern times, the text of a Church Slavonic Roman Rite Mass survives in Croatia and the Czech Republic, which is best known through Janáček's musical setting of it (the Glagolitic Mass). ^ Hammarström, Harald; Forkel, Robert; Haspelmath, Martin, eds. (2017). "Slavic". Glottolog 3.0. Jena, Germany: Max Planck Institute for the Science of Human History. ^ According to the data taken from Anatole V. Lyovin, An Introduction to the Languages of the World, Oxford University Press, New York – Oxford, 1997. ^ cf. Novotná & Blažek (2007) with references. "Classical glottochronology" conducted by Czech Slavist M. Čejka in 1974 dates the Balto-Slavic split to −910±340 BCE, Sergei Starostin in 1994 dates it to 1210 BCE, and "recalibrated glottochronology" conducted by Novotná & Blažek dates it to 1400–1340 BCE. This agrees well with Trziniec-Komarov culture, localized from Silesia to Central Ukraine and dated to the period 1500–1200 BCE. ^ Kapović (2008, p. 94) "Kako rekosmo, nije sigurno je li uopće bilo prabaltijskoga jezika. Čini se da su dvije posvjedočene, preživjele grane baltijskoga, istočna i zapadna, različite jedna od druge izvorno kao i svaka posebno od praslavenskoga". ^ Sussex, Roland, Paul Cubberley. 2006. The Slavic languages. Cambridge: Cambridge University Press. P.19. ^ Седов, В. В. 1979. Происхождение и ранняя история славян. Москва: Наука. ^ Barford, P.M. 2001. The Early Slavs: Culture and Society in Early Medieval Eastern Europe. Ithaca: Cornell University Press. ^ Curta F. 2001. The Making of the Slavs: History and Archaeology of the Lower Danube Region, c. 500—700. Cambridge: Cambridge University Press. ^ Heather P. 2010. Empires and Barbarians: The Fall of Rome and the Birth of Europe. Oxford: Oxford University Press. ^ Hellquist, Elof (1922). "torg". Svensk etymologisk ordbok (in Swedish). Project Runeberg. Retrieved 27 December 2006. ^ Hellquist, Elof (1922). "tolk". Svensk etymologisk ordbok (in Swedish). Project Runeberg. Retrieved 27 December 2006. ^ Hellquist, Elof (1922). "pråm". Svensk etymologisk ordbok (in Swedish). Project Runeberg. Retrieved 27 December 2006. ^ Titz, Karel (1922). "Naše řeč – Ohlasy husitského válečnictví v Evropě". Československý vědecký ústav vojenský (in Czech): 88. Retrieved 26 January 2019. ^ Harper, Douglas. "vodka". Online Etymology Dictionary. Retrieved 18 May 2007. ^ Harper, Douglas. "sable". Online Etymology Dictionary. Retrieved 18 May 2007. ^ cf. : Deutsches Wörterbuch von Jacob Grimm und Wilhelm Grimm. 16 Bde. [in 32 Teilbänden. Leipzig: S. Hirzel 1854–1960. ], s.v. Vampir; Trésor de la Langue Française informatisé; Dauzat, Albert, 1938. Dictionnaire étymologique. Librairie Larousse; Wolfgang Pfeifer, Етymologisches Woerterbuch, 2006, p. 1494; Petar Skok, Etimologijski rjecnk hrvatskoga ili srpskoga jezika, 1971–1974, s.v. Vampir; Tokarev, S.A. et al. 1982. Mify narodov mira. ("Myths of the peoples of the world". A Russian encyclopedia of mythology); Russian Etymological Dictionary by Max Vasmer. ^ Harper, Douglas. "vampire". Online Etymology Dictionary. Retrieved 21 September 2007. ^ "Indo-European, Slavic". Language Family Trees. Ethnologue. 2006. Retrieved 27 December 2006. Comrie, Bernard; Corbett, Greville. G. (2002). "Introduction". In Comrie, Bernard; Corbett, Greville. G. (eds.). The Slavonic Languages. London: Routledge. pp. 1–19. ISBN 0-415-28078-8. Lockwood, W.B. A Panorama of Indo-European Languages. Hutchinson University Library, 1972. ISBN 0-09-111020-3 hardback, ISBN 0-09-111021-1 paperback. Kalima, Jalo (April 1947). "Classifying Slavonic languages: Some remarks". The Slavonic and East European Review. 25 (65). Kapović, Mate (2008). "Uvod u indoeuropsku lingvistiku" (in Serbo-Croatian). Zagreb: Matica hrvatska. ISBN 978-953-150-847-6. Novotná, Petra; Blažek, Václav (2007). "Glottochronology and its application to the Balto-Slavic languages" (PDF). Baltistica. XLII (2): 185–210. Archived from the original (PDF) on 31 October 2008. Schenker, Alexander M. (2002). "Proto-Slavonic". In Comrie, Bernard; Corbett, Greville. G. (eds.). The Slavonic Languages. London: Routledge. pp. 60–124. ISBN 0-415-28078-8. Wikimedia Commons has media related to Slavic languages. Leo Wiener (1920). "Slavic Languages" . Encyclopedia Americana.